We joined the sixth form when we were sweet sixteen. We had taken our O-levels. Our reward for our academic endeavours was ditching the school uniform and getting our common room. This was ours to hang out in during breaks and clear periods (when we had no lessons). The rooms were at the back of the school, underground. This subterranean environment was known as the Dungeons, even by the teachers. In fact, there were two rooms: one had little desks and no sofas, the other one had a cassette deck with big old knackered settees. Guess which one I gravitated towards. The battle though was to get there first and drop your C60 or C90 into the tape machine (C120’s were too unreliable). The two years we were there were formative in many ways. In particular, musical boundaries were drawn and crossed. There was a core set of songs that pervaded through our time there. Maybe it was a symptom of the times or perhaps it was a result of the relative multi culturalism in the West Midlands, but many of these songs were from differing genres. It was just after the two tone revival and this probably informed things as well. I was always aware of reggae growing up near Wolverhampton. As a youngster, though it would be stretching it hugely to say that I was into reggae, it did seem to be prevalent. My football team, Wolverhampton Wanderers, ran out to “The Liquidator” by the Harry J All-Stars. Ruby Red Records in Wolverhampton and Graduate Records in Dudley both stocked a good selection of the music. This is one of those cross-genre examples – “Stop That Train” by Clint Eastwood and General Saint. We didn’t know it at the time but it was a well covered version of a sixties Ska song originally by the Spanishtonians. There was a rocksteady version in 1967 by Keith and Tex. This hadn’t got the “500 miles” folk song section introduced in the Clint Eastwood version but is more similar in tempo. It was used in the film “The Harder They Come.” Big Youth added some toasting and dubbed it up a little. Back to our version. It was perfect for the common room. It was instantly catchy, repetitive and didn’t suffer from being rewound and replayed endlessly. General Saint was a British DJ born Winston Hislop and Clint was Jamaican from a reggae dynasty. Born Robert Brammer, he took the trend of taking names from the spaghetti westerns one step further by claiming Clint’s name. After recording on Channel One and with Bunny Lee, he moved to the Greensleeves label. This is where he hit the big time in the Midlands. The Greensleeves label was huge at this time in the UK and served to establish Jamaican artists in the key markets of London and the Midlands. I’ve posted two versions of the video. Here’s the first. It is a sweet low budget video from an unknown TV show of the era. The second is a video with visuals from the “Reggae Heartland” movie. The audio version is closer to our favoured version, which I think may have been the 12″ mix. 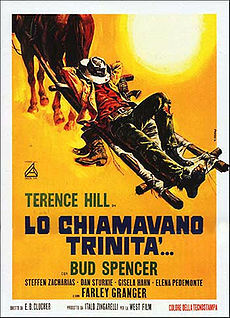 Clint was the brother of Trinity, originally known as Wade Brammer and taking his name from Lo chiamavano Trinità or “They Call Me Trinity”, a 1970’s spaghetti western comedy which I haven’t seen. Trinity’s big hit was “Three Piece Suit and Thing” which was essentially him toasting over Alton Ellis’s “I’m Still In Love With You”. This was the start of slackness informing Reggae. Slackness was the sexualisation of the material, bawdy but not so much as the dancehall scene which broke in the eighties and was probably the point where white British mainstream audiences started to drift away from Jamaican music. The new style was difficult to follow after the feel good and roots reggae enjoyed by this casual audience in the seventies and early eighties. 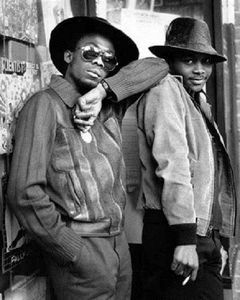 And now we hit the motherlode – because in response to Trinity’s record came one of my all time favourite reggae singles – “Uptown Top Ranking”! Any excuse to play this clip – it just brings the 1970s flooding back to me. Althea and Donna were just 17 and 18 at the time. The backing may be a Top Of The Pops approximation of the original (this was in the day when artists had to record a new version to sing over) but it is worth it to see joy and innocence in the girl’s performance. I’m intending to write about some of those other songs which got played to death from 1983 to 1985 but this one’s the start. Another great track. I really miss that we don’t get exposed to contemporary Jamaican music anymore. I would struggle to remember the last reggae track that I enjoyed at the time it was released and that’s down to ignorance on my part. Great times in Brum though.